The community of Claussen in rural Florence County is the site of Hopewell Presbyterian Church, the first of its denomination in the area and the oldest Presbyterian church in the county. It was founded in 1770, in what became Marion County in 1785. Present-day Claussen was then included in Florence County when the county formed in 1888. 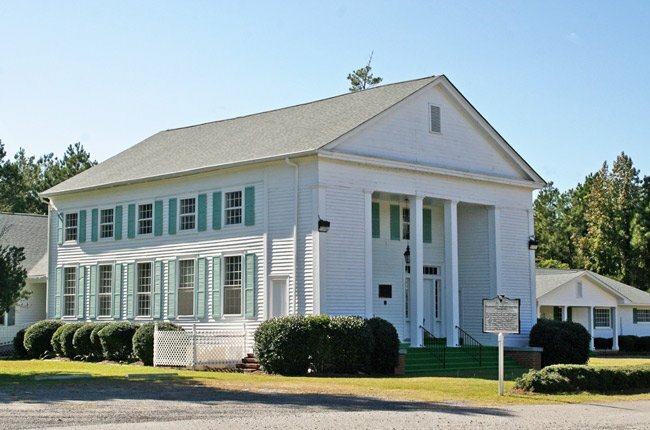 It is a daughter church of historic Williamsburg Presbyterian Church in Kingstree, and many of the congregation’s first members came from Indiantown Presbyterian Church in nearby Hemingway. Construction on the church’s first meeting house began across the street from the present site, where the churchyard currently sits, shortly after the congregation was formed. It burned shortly after it was completed. The first church was quickly replaced by another building, which served the church until 1842. That year, the church elders decided that the congregation needed a newer, larger building for worship. The present two-story Greek Revival church was built in 1842. The second floor was used as a slave gallery. In fact, in 1841, of 254 church members, 139 were African-Americans. Hopewell Presbyterian Church spurred the formation of other Presbyterian churches in the area, including Darlington Presbyterian Church in 1827, First Presbyterian of Florence in 1861, and Effingham Presbyterian Church in 1906. Some changes and modifications to the church have been made over the years in response to church growth. In 1958 a brick veneered educational building was added to the church, which is painted white. An addition to the rear of the church was built in the early 1980s, which bears a vinyl exterior. The church pews within Hopewell Presbyterian Church are original. Interred within the graveyard are William Harlee, the founder of the City of Florence, and his daughter, Florence, for whom the city is named. Hopewell Presbyterian Church and Hopewell Cemetery are historically related properties set at opposite sides of Old River Road in the Claussen community of rural Florence County. The church, completed in 1842, is a good example of a two-story frame edifice in the Greek Revival style. The church has a pedimented front gable end, two-story portico with two wood pillars and matching pilasters at the enclosed outer bays, and bands of five windows, taller at the principal level, at the side elevations. The building is clad in weatherboard, except the tympanum and wide architrave have flushboard siding, and rests on a brick pier foundation with brick infill. The cemetery, in use since the late eighteenth century, occupies a three-acre site where the original Hopewell Presbyterian Church stood. It contains a notable collection of nineteenth century marble headstones and monuments, many signed by their carvers, laid out in a distinctive pattern of alignment by family. Inside the cemetery is the church’s early Session House. Most churches are established to serve the needs of the local people. Time has shown that some congregations go above and beyond the call of duty and play a very important role in establishing other churches, called daughter churches. Hopewell Presbyterian is one of those churches. 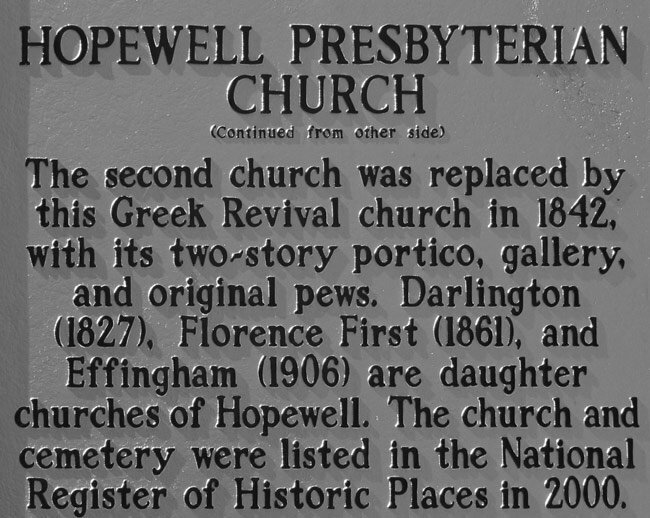 Hopewell has been instrumental in starting Darlington Presbyterian (1827), Florence First Presbyterian (1861) and Effingham Presbyterian (1906). Hopewell did this from a feeling of responsibility, but the church also had a good example. Hopewell is the fourth daughter church of Williamsburg Presbyterian (1736), which is the mother church of eleven churches and grandmother to eighteen churches. 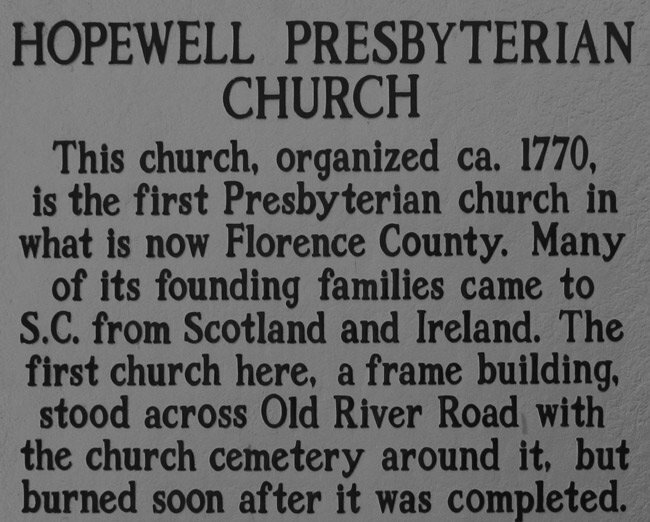 Hopewell, the oldest Presbyterian church in Florence County, became a pioneer Presbyterian church in an area of South Carolina that was part of Marion County in 1770. Many of the charter members came from a sister church, Indiantown Presbyterian. Some came directly from Ulster in Northern Ireland to start a new life for themselves. John Gregg, his four sons, and a son-in-law were among the first elders of Hopewell. The Gregg family has been so instrumental in the continuing growth of Hopewell that at least one Gregg descendent has been an elder of Hopewell since its beginning. The first full-time minister was called in 1790 to preach at the recently built church, which was located in the present graveyard. That building accidentally burned to the ground shortly after it was built and was replaced in the same location by a building that stood until 1842. During these years a geometrical graveyard was laid out surrounding the church building. In early 1842 the decision was made to build a new house of worship. The elders decided to locate the building across Old River Road and facing the graveyard. Unfortunately, the early written records of the church were burned in an 1896 residential fire. Little is known about the construction of the present 1842 church building. The “Minutes of Session” dated 1897 does recount a great deal about the men who were involved in the church at the time of its 1842 construction project. Without mention of the designer or builder of the building, the minutes indicate that the style of the building shows a congregation whose decision makers were aware of current architectural tastes in its Greek Revival design. The modified temple form of the building was in the mainstream of the 1840s design for larger city churches, indicating that these backwoods members had the financial means to travel to other cities. The tall two-story building is located in the Claussen community at 5314 Old River Road. Once you see the building, there will be no doubt that it’s an old building. Two twelve-inch square pillars support the two-story recessed portico with matching pilasters at the enclosed outer bays. The building is clad in wood weatherboard, except the flushboard siding in the gable. The two pairs of double doors with narrow sidelights lead directly into the one room sanctuary. There are ten windows on each side, with the lower five on each side opening to the main sanctuary and the upper five into the balcony. Alterations and additions have been made to the historic church building as the congregation has grown over the years. A brick veneered educational building, which is painted white, was constructed to the right in 1958. The most significant change to the campus came in the early 1980s when a one-story vinyl siding clad frame addition was made to the rear of the original building. While vinyl siding may not be a historian’s choice, from a practical stand point, Hopewell has made a respectable attempt to blend the two buildings together. Perhaps the only historical feature lost with the addition was the external stairway leading up to the slave balcony. History has proven that African Americans were very instrumental in the growth of Hopewell. With a total membership of 254 in 1841, 139 of those were black members. Most of those were slaves of the local plantation owners. Plantation owners realized the importance of providing a place for their slaves to worship. Was that worship experience an option for the slaves? We don’t know the answer to that question, but during the pre-emancipation time, slaves and owners worshiping together at church was the practice. Was this the proper way to worship? We can’t answer that question, either, but we do know that after the War between the States many slaves went on to form their own congregations. Would these slaves have started their own churches without this exposure to worshiping? We can’t say for sure here, either, but these citizens have gone on to be God-fearing citizens adding to the quality of life in each community in which they live. Another important feature of Hopewell’s site is the graveyard located across Old River Road. Both the church and the graveyard were placed on the National Register of Historic Places on June 2, 2000. The graveyard occupies just over three acres of the original site of Hopewell. In 1842 when the second building was removed, burial sites became available in that space to form a rectangular fenced in graveyard. The wrought iron fence across the front was installed in the early 1900s by Stewart Iron Works Company of Ohio. The gateway arch with finials and scrolled volutes bears the name, “Hopewell”. While we’re talking about a graveyard, who knows the difference between a graveyard and a cemetery? Even though both are used as a burial ground, there is a technical difference. A graveyard is a burial ground owned by and attached to a church or churchyard. A cemetery is simply a public burial ground. Think about that as you drive through the Bible Belt of South Carolina going from point A to point B – you’ll know a tid-bit of information that not many other people know. My family went there. Their house stood in the pecan trees at the crossroads now most call it Moores but on older maps it was Pearces Crossroads. Three generations of doctors grew up there. Oh wow! We can only imagine how warm that must have been! My parents were married there in 1948. I remember going to church there as a child and using hand fans to try and keep cool in the summer, it wasn’t possible. Thank you, Wade. That would be wonderful! My great-grandfather, Edgar Geddings Smith, served as pastor of Old Hopewell in the 1880s. While at Hopewell, the Reverend Smith married Mary Eleanor Singletary of Mars Bluff.I have a very large photo of the Reverend Smith. I will attempt to get it copied and forward it on.